Recorded live at the Controindicazioni Festival in Rome – October 2003. This concert draws together my work with live improvisation, songs, field recordings, real time sampling, digital treatment and looping, using my acoustic and electric lap steel guitars. The music moves continuously and very slowly through five movements. Opening with ‘Reluctant Swimmer’, an improvisation on my 1920s National Steel Resophonic Tri-Plate guitar and leads into ‘Movies Is Magic’ a song by Van Dyke Parks. ‘Virtual Surfer’ another improvisation follows played on my Vietnamese electric lap steel leading into ‘Dolphins’ a song by Fred Neil and then finally a coda of ‘Virtual Surfer’ closes the set. This was the first time I had sung ‘Dolphins’ a song I remember hearing Tim Buckley sing in the late 60s. Past present and future music? The cd is the complete concert, heard as played, minus the first ten minutes, which I chose not to use. This is one of my favourite live recordings in my Hipshot series and was a landmark concert for me – opening up free improvising with loops and electronics to songs. A direction I have since pursued with enthusiasm. The sample here is an edited of the ‘Dolphins’ section. 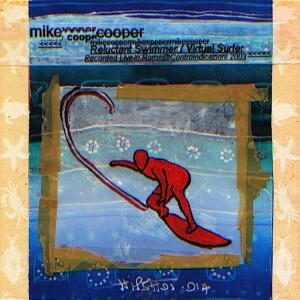 ‘Cooper, now in his sixties, is making the most adventurous music of his life. (This) album is incredibly rich and evocative, and as a live performance, it’s utterly flawless. Cooper takes live guitar processing and sampling as his raw material, using it to build something complex and substantive, full of ideas and surprises, not just abandoning it half-formed. 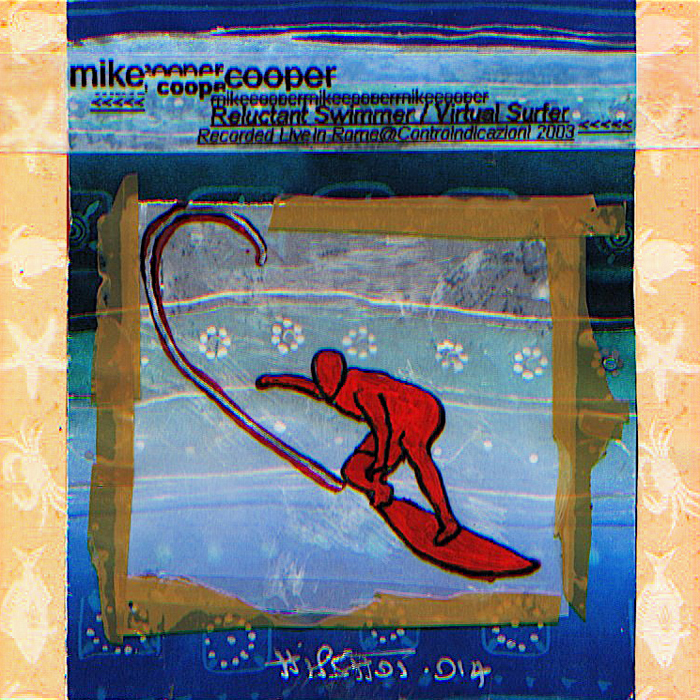 Everyone who thought Fennesz’ last record was the best of 2004 would do well to listen to Mike Cooper’s Reluctant Swimmer/Virtual Surfer, to hear similar musical strategies brought to their full potential by a veteran musician in his artistic prime.’– Jonathan Dean-Brainwashed Web Review. ‘Much as Sylvian, Bailey and Fennesz should be lauded for their work on the former’s Blemish album, Cooper’s audacious, unfettered performance marks an equally inspiring advance in marrying experimental sonics with song.’ – Keith Moline – Wire Feb. 2005.